Year 175 BC was a year of the pre-Julian Roman calendar. At the time it was known as the Year of the Consulship of Scaevola and Lepidus. The denomination 175 BC for this year has been used since the early medieval period, when the Anno Domini calendar era became the prevalent method in Europe for naming years. Antiochus IV Epiphanes was a Hellenistic Greek king of the Seleucid Empire from 175 BC until his death in 164 BC. He was a son of King Antiochus III the Great. His original name was Mithradates ; he assumed the name Antiochus after he ascended the throne. 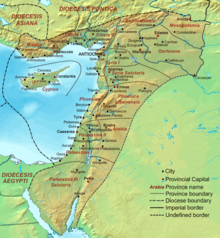 Notable events during the reign of Antiochus IV include his near-conquest of Egypt, his persecution of the Jews of Judea and Samaria, and the rebellion of the Jewish Maccabees. Cleopatra Selene was the monarch of Syria as Cleopatra II Selene. She was the daughter of Ptolemy VIII of Egypt by Cleopatra III, in whose political maneuvers Cleopatra Selene, favored by her mother, became a pawn. In 115 BC, Cleopatra III forced her son Ptolemy IX to divorce his sister-wife Cleopatra IV, and chose Cleopatra Selene as the new queen consort of Egypt. Tension between the king and his mother grew and ended with his expulsion from Egypt, leaving Cleopatra Selene behind; she probably then married the new king, her other brother Ptolemy X.
Lysimachia was an important Hellenistic Greek town on the north-western extremity of the Thracian Chersonese in the neck where the peninsula joins the mainland in what is now the European part of Turkey, not far from the bay of Melas. 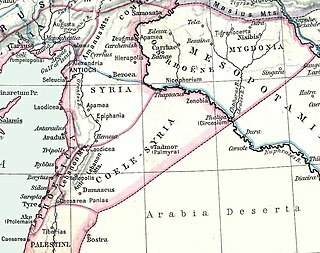 Perea or Peraea, was the portion of the kingdom of Herod the Great occupying the eastern side of the Jordan River valley, from about one third the way down from the Sea of Galilee to about one third the way down the eastern shore of the Dead Sea; it did not extend very far to the east. Herod the Great's kingdom was bequeathed to four heirs, of which Herod Antipas received both Perea and Galilee. He dedicated the city Livias in the north of the Dead Sea. In 39 CE, Perea and Galilee were transferred from disfavoured Antipas to Agrippa I by Caligula. With his death in 44 CE, Agrippa's merged territory was made province again, including Judaea and for the first time, Perea. From that time Perea was part of the shifting Roman provinces to its west: Judaea, and later Syria Palaestina, Palaestina and Palaestina Prima. Attested mostly in Josephus' books, the term was in rarer use in the late Roman period. It appears in Eusebius' Greek language geographical work, Onomasticon, but in the Latin translation by Jerome, Transjordan is used. The Syrian tetrapolis consisted of the cities Antioch, Seleucia Pieria, Apamea, and Laodicea in Syria.